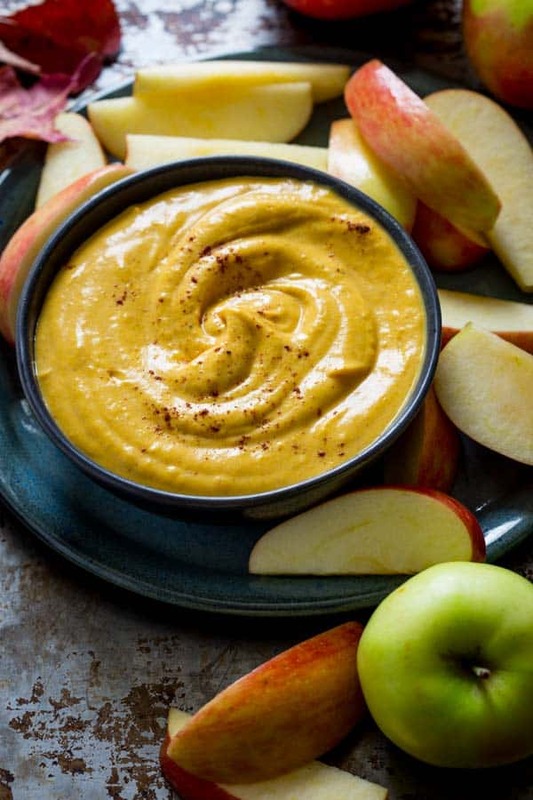 This maple pumpkin pie dip is a delicious and super easy snack that kids love! It is made with cream cheese, canned pumpkin, maple syrup and a little spice. Serve it with apples or gingersnaps. As a recipe developer and food blogger, it never fails to totally bowl me over when I go to a party or to someone’s house and they serve me one of my own recipes. What a giant compliment! 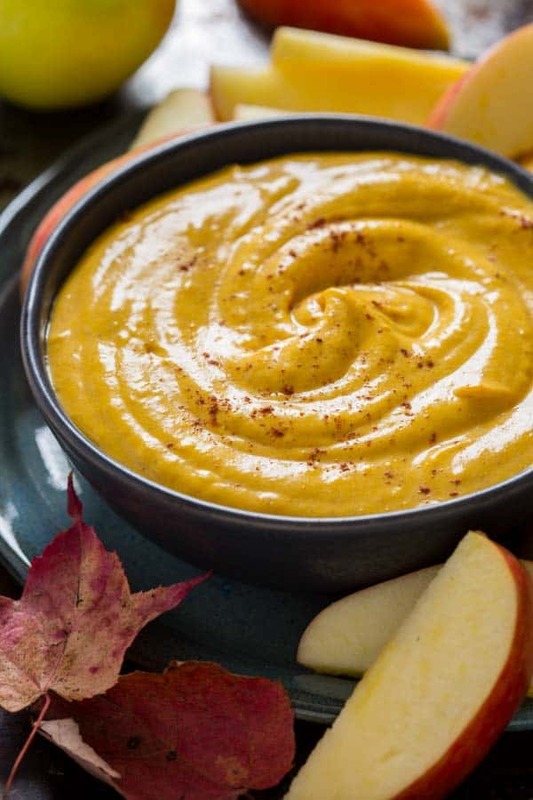 This Maple Pumpkin Pie Dip is one of those recipes where that’s happened more than once. One time I served it at a party and my friend arrived with a batch she had made to share as well! That was a first! I shared it on the blog here back in 2010 and it is another one of the recipes I have myself made more times than I could possibly count. 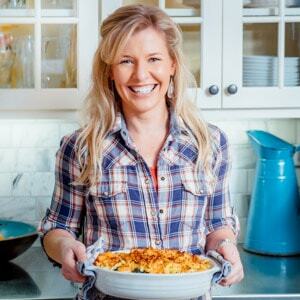 I started making it back in my personal chef days for a family with three kids. They asked for it repeatedly. Now more than 10 years later, my own kids ask for it repeatedly. They even ask to bring a batch to school for their special birthday snack. (That’s right, no cupcakes, classmates. Sorry! So proud.) I even have demoed it for my daughters class with the cooking cart. K, so you get it. 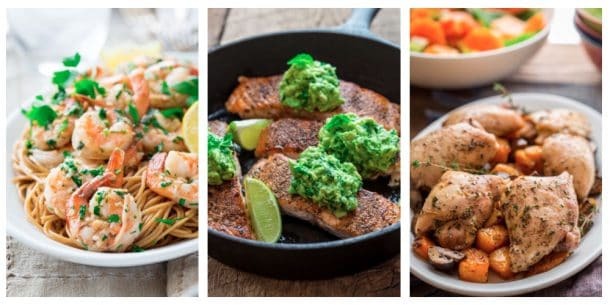 It is just one of those recipes that once you’ve made it, and you know how easy it is to make and how great it is, it becomes one of those go to again and again recipes. Both kids and grown-ups love it. And now it will start a new chapter as one of the most beloved recipes in my cookbook. It’s head-slappingly easy. You can pretty much make it anywhere as long as you can plug in a mixer. That’s why I plan to make it on book tour next month. Have maple pumpkin pie dip, will travel. That’ll be my motto! Which brings me to the other point…I really really want you to come visit me on book tour next month! I’ll be making stops mostly in New England in the North East. Boston, Burlington, Madison CT, South Hadley MA, Philly, Chicago and a bunch of other Vermont stops as well. We will also be adding dates as details firm up. I’ve created a page with the Maple Book Tour for you to check in on. I’ll be doing demos and handing out samples as well as answering questions and doing signings. I really mean it when I say I would love to have you come out for one (or more) of these events. And you may have noticed that I haven’t been able to post as frequently in the last few weeks. I hope you don’t mind. I have been in a flurry of organization behind the scenes. I have made all my packing lists, prep lists, shopping lists, BodyPump sub lists and who’s going to babysit lists. And checked them twice. Now that it is all laid out on the calendar, I am so excited! It all seems so much more real and I am so excited for it. If you want to make sure not to miss a post, you can also sign up for my email list to get the posts sent to your inbox. 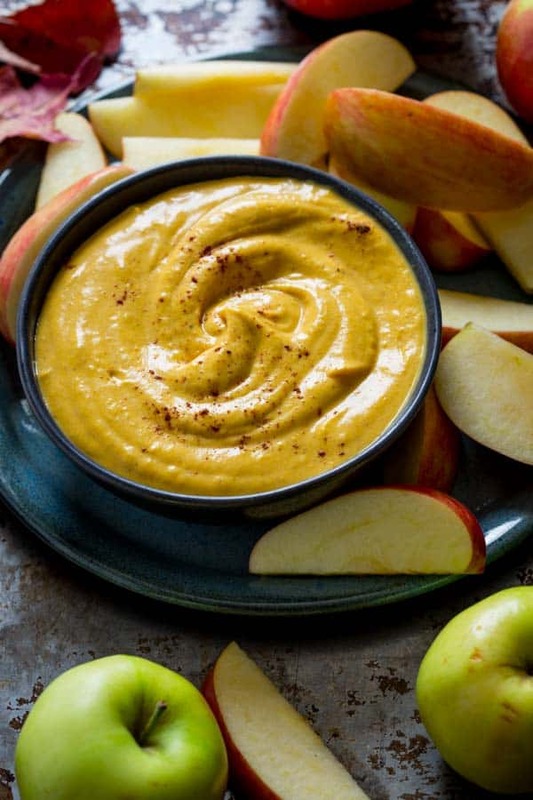 This maple pumpkin pie dip is a snack that kids love! It’s made with cream cheese, canned pumpkin, maple syrup, & spices. Serve with apples or gingersnaps. Beat Neufchatel with an electric mixer on medium-high speed in a large bowl until smooth. Gradually beat in pumpkin, maple syrup and spice. Beat until smooth. 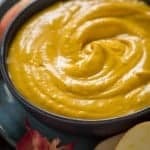 i have not made a pumpkin dip but it sounds pretty darn good. if everyones asking and making it, im seriously missing out here. i hope you come to Dallas for the tour too. Thanks and yes, try it! Well I would just love the opportunity to come that way. I have loads of family in Texas, so it would be so fun. 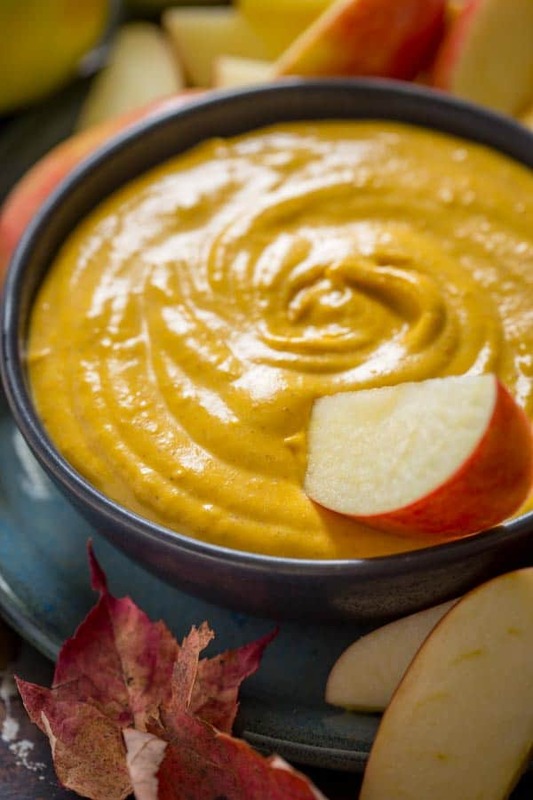 4 ingredients to cheesy-pumpkiny goodness! This dip looks so creamy, Katie, I’ve gotta try this! I checked out your blog tour and boo – you’ve not coming to Atlanta 🙁 I would have made and brought some of this dip to you – just like your friend did! 4 ingredients, that is doable, right? Thank goodness for recipes like this! This looks so creamy and pumpkin-y and dreamy. It just screams Fall! Perfect for a girls night in by the fireplace :)) Pinned! Hey Debbie! Yes we zoomed over and back already! We landed on Thursday am and left on Sunday am. Honestly it was too short. It feels like a dream. But it did totally jazz me about getting back over there. Next time with the girls though! I wish you could come to the Philly stop too. I am hoping to stay at my dad’s that weekend. This look fantastic! I see the calories per serving, but not the serving size? Could you please provide that information. Thank you. Hey Sharon, funny you should ask! I am having my nutrition intern do all the analysis on the recipes here. I forgot to say what the serving size is to her- it’s 1/4 cup. We were literally talking about that yesterday. I think this one needs a tweak and was analyzed with a larger serving. Stay tuned. I think the cal count will drop. I would totally love that Alex. I am needing another one of your yoga classes by the way! Drooling! 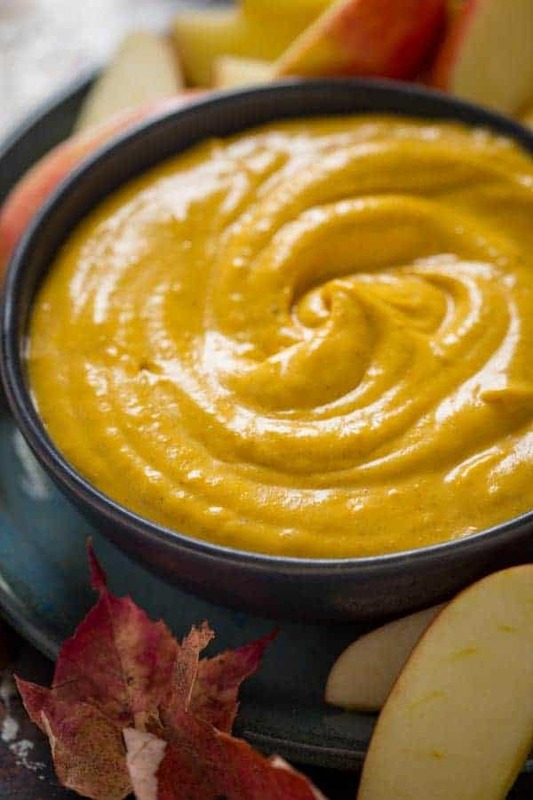 I love pumpkin and this looks mouthwatering! My mom and I are coming to see you in Boston! Can’t wait to try the dip and say hi! So glad to hear it Stephanie!! I can’t wait. I look forward to meeting you both and for you to see the book. I just found out that the Trident event will be postponed! I’ll keep you posted when they find another date. 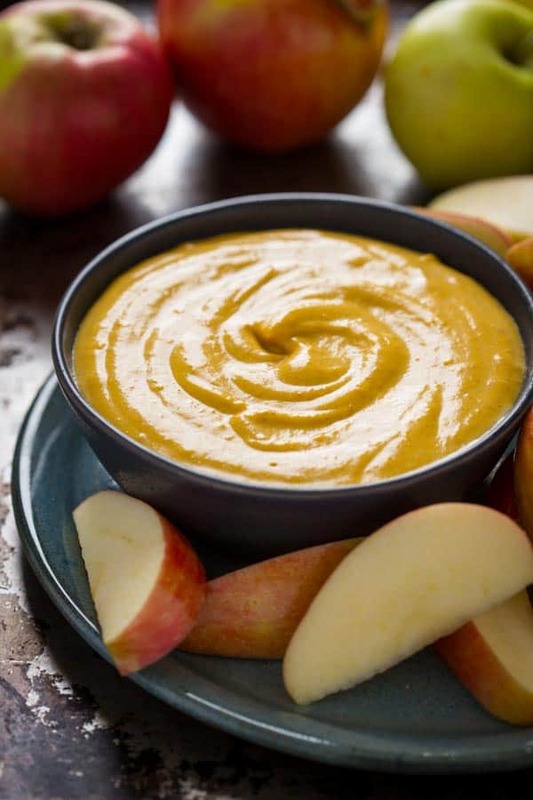 What do you dip in the pumpkin dip other than apples ? Does it go on crackers ? ?